Procter Contracts has partnered with NBS Plus and now information about the company’s high-quality fencing, gates and street furniture is available to architects and specifiers using the NBS (National Building Specification) system. 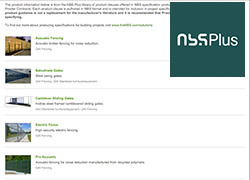 Thousands of architects, architectural designers, landscape architects, engineers and specifiers use the RIBA NBS system when preparing specifications for construction projects large and small. These users can now access information about the following products from Procter Contracts: acoustic fencing, balustrade gates, cantilever sliding gates, electric fence, Pro-acoustic noise barriers, Pro-mesh fencing, Pro-sure fencing, Rondo railings and telescopic gates. More products will be added to the Procter Contracts profile over the coming months. More than 20 downloads are also available via the RIBA Product Selector website for users requiring more detailed product information or those wanting to read case studies or view product drawings. In addition, this website has copies of Procter Contracts’ third-party certifications for Building Confidence, CHAS and ISO 9001. Managing multiple suppliers and contractors can be time-consuming and costly, so Procter Contracts is finding that clients are increasingly turning to it for projects requiring fencing and/or railings, gates (automatic and manual), street furniture and architectural metalwork, particularly when there is a need for bespoke products or a combination of bespoke and standard products. Having established the Procter Contracts division, Procter Bros Ltd has enabled the three business units Procter Fencing Systems, Procter Automatic Gates and Procter Street Furniture to work better together for the benefit of clients, further building on the excellent reputations that the three had previously established for themselves in terms of quality and customer service. To find out more about the products and services available from Procter Contracts. Alternatively, contact Procter Contracts to discuss specific projects by emailing [email protected] or telephoning +44(0)800 2944177.